Knowing your area's Absorption Rate, helps to track trends. Understanding the market and where it is headed is part of our job as real estate professionals. Absorption rate is NOT an exact science. Figuring it is based on the premise that one will be looking for a TREND. It is advised to consistently do the numbers each month, to be able to track a trend. You need to know 2 figures. 1) How many listings are currently on the market? 2) How many listings sold last month? You will be counting under-contract or pendings as listings, since they are not SOLD yet. Multiple the number of solds last month by 12 (months). Divided by the current listings equals # of Units that would sell each week. 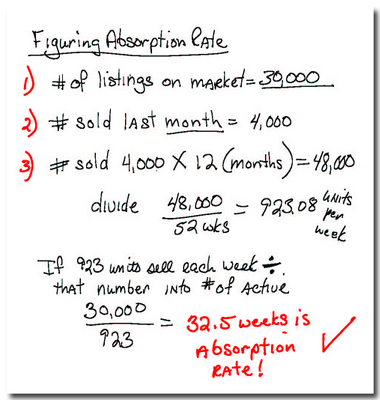 Divide the # or units that should sell each week into the number available = absorption rate. I Googled 'real estate absorption rate definition' and your post was right smack dab at the top! Great post - even 4 years later! Congrats, top of Google search! This is a great resource! funny - I had a broker ask me to explain this yesterday and the very first thing that came into my mind was your post! I don't think I commented before, but had to now since it obviously left an impression on me. Glad to be of assistance Courtney! balanced to sellers market in Vancouver and Toronto based on the areas i work in. This is the most simple and easy to understand explanation of absorption rate I have ever found. Appreciate the information! Hello Kristal! I miss you and your humor and photos! I was looking for a reminder for calculating absorption rate and came upon yours! Interestingly, in this market, the number of sales fluctuates depending on the time of year - I find some months we have many more sales than others (ie: we have more closings in July and August than any other times of the year!) Therefore I find using a yearly average, vs the monthly average, much more helpful. Thanks for this post way back when! I was looking for an explanation of the published absorption rate in our market, and your providing the method of calculating explains it perfectly. Still helping with your words years after written...how awesome! Just as Courtney Cooper (#84) said above, someone asked me to explain the meaning of absorption rate and the trusty AR search brought me right to you! ^^^ If you do the calculations in weeks and want to also know months, simply divide the result by 4.333 (which is the average number of weeks in a month). In the example from the blog, you'd divide the 32.5 week absorption rate by 4.333, and you'd get 7.5 months. You would have come to this same conclusion by simply taking the current number of listings on the market (30,000) and dividing by the previous month's closings (4,000). Voila! 7.5 months for the absorption rate. So, if all you care about is months, you can save a couple of steps in the calculations. Krystal, thank you for another fine blog. I use absorption rate often as it is greatgtool especially for the analytical seller. It helps us determine more accurately the days on the market and how to price the home appropriately. In Real Estate we must depend on many factor's as to determine the best way to market a home. Mark thanks for the reminder of how to calculate for monthly vs. weekly. Use this in 2012 and see if it helps you with your marketing to the seller. Hi Krystal, thanks for sharing. I am a stats guy and that is one I was not sure how to calculate. This made it in the top ten views of the year. Many, many kudos to you! This is very easy to follow steps. Thank you for providing them. That's interesting. I'd like to re-post this, but not sure if that's okay? I'm new to AR and blogging. Thanks so much. This came in handy for verifying we were doing the calculations correctly for class. Very easy to follow. I have bookmark this post several years ago and refer to its simple explanation.